07 Oct 2007 - Osceola Velo Club's Dave Zak raced back-to-back days during the final weekend of the 2007 Florida road racing season in Pinellas Park, FL on 06 & 07 Oct 2007. On Saturday, Dave Z. lined up for the combined Men's Cat 4 & 5 Circuit Race, the final race in the 2007 Florida Points Series (FPS). On Sunday, Dave was at it again, this time in the non-FPS Men's Cat 5 Road Race. Dave fared much better the second day, staying with the Cat 5 peloton for nearly 4 of the 6 laps and finishing with a few others a little ways behind the main field for 13th place. And to top it off, this weekend's two races gave Dave experience in a total of 10 mass-start races, allowing him to upgrade to Men's Cat 4 in 2008. Way to go, Dave! Check out the photos. 07 Aug 2007 - Osceola Velo Club's road racing regulars Pat Schlager, Dave Zak, and Christian Bastian lined up for the fifth and final B-race of the 2007 Lake Louisa Cycling Series on 07 Aug 2007. Despite not being fully recovered from his spectacular crash a week earlier at the Independence Training Criterium in Windermere, Pat S. decided to have a go on the opening lap when he chased after an attacking Cycle-Logic rider on the uphill sections. Coming out of the first hairpin turn, Pat found himself in the lead with the field strung out a little ways behind. Not feeling like going it alone so early in the race, Pat eased up and drifted back through the speeding peloton. After a series of attacks and counterattacks by other teams on the second lap, Pat dropped off the back of the main field and continued in the forming autobus for the remainder of the 20-mile race. Dave Z. and Christian B. stayed with the peloton a while longer but were also detached later in the race. Dave finished best of the team, then Christian, and then finally Pat. 25 Jul 2007 - Osceola Velo Club's resident triathlete Gabriel Kotch joined road racers Pat Schlager, Dave Zak, and Christian Bastian for the fourth race in the Lake Louisa Cycling Series on 24 Jul 2007. The entire team rode strongly in the pack during the opening laps of the 25 mile B-race. Although the steady pace of the peloton on the rolling parcours prevented any breakaways, attrition set in and the main group was whittled down to 20 or so riders by the race's midpoint with Osceola Velo Club's Pat S. and Christian B. still present. The hammer dropped during the final kilometer, stringing out the lead group for the final time up the finishing hills. Pat S. hit the afterburners on the final 200-meter gradient to overtake a handful of other racers for a top-15 finish. Great racing, team! 07 Jul 2007 - Despite feeling under the weather all week, Osceola Velo Club's Gabriel Kotch put in a very respectable performance at the 3rd Annual Orlando Triathlon at Baldwin Park (Winter Park, FL) on 01 Jul 2007. Gabriel's total time of 1:13:56 for the 0.75 Km Swim/13.4 Mile Bike/2.5 Mile Run was good enought for 10th place in his age group. Way to go, Gabriel. 27 Jun 2007 - Osceola Velo Club had a full complement of racers on hand for the third race in the Lake Louisa Cycling Series held in hot and windy conditions on the rolling hills in Lake Louisa State Park just south of Clermont, FL on 26 Jun 2007. Racing regulars Pat Schlager and Dave Zak were joined by our newest club member Christian Bastian for the 25 mile B-race. A 5-racer group got away early in the race and never looked back while the remainder of the field was splintered by the strong winds and deceptive grandients to finish in dribs and drabs. Christian B., Pat S., and Dave Z. crossed the line in (an estimated) 11th, 13th, and 15th place, respectively. Good racing, team. 25 Jun 2007 - Osceola Velo Club's Gabriel Kotch competed in the Zephyr Sport Sprint Triathlon Series event in St. Leon, FL on 24 Jun 2007. Gabriel's total time of 1:14:01 for the 0.25 Mile Swim/10 Mile Bike/3.1 Mile Run was good enough for 7th place in his age group. Well done, Gabriel. 24 Jun 2007 - Osceola Velo Club's Pat Schlager put in an excellent performance at the Deland Cup Time Trial held in Deleon Springs, FL on 23 Jun 2007. This was to be the second stage of the Deland Cup Stage Race. Unfortunately for all, including Pat who was destined to pick up yet another Florida Points Series point, the time trial was cancelled mid-event by the promoters due to a number of reasons. On a happier side note, Pat's average speed at Deleon Springs was his fastest in a time trial this season. Yeah, Pat. 17 Jun 2007 - Osceola Velo Club's Pat Schlager scored another Florida Points Series (FPS) point at the Florida State Time Trial Championships in Olustee, FL on 17 Jun 2007. The course was an out and back, essentually flat, route which started and ended in the scenic Osceola National Forest (no affiliation with the club, by the way) in Northeast Florida. Pat's time was good enough for 20th place in his category. Pat now has a grand total of 2, count 'em, 2 FPS points for 2007. 07 Apr 2007 - Osceola Velo Club's Dave Zak and Pat Schlager demonstrated a textbook display of unselfish teamwork to ensure that they both completed the full 75 km race distance in the Men's Cat 4/5 race at the Webster-Roubaix Road Race held near Webster, FL on 07 Apr 2007. The Webster-Roubaix course was accentuated by a 2.5 km long section of occasionally rough, bumpy, and skiddy "hard packed dirt" unpaved roadway on each 15 km lap which could jar loose a water bottle from the snuggest of cages. 24 Mar 2007 - Osceola Velo Club's Dave Zak put in a gallant effort in the Men's Cat 5 race at the Spin City Classic Criterium held in downtown Orlando, FL on 24 Mar 2007. However, the officials were pulling racers whom they felt were "out of contention" rather early in the race which, unfortunately, included Dave who was just finding his rhythm with other dropped racers. Still, good racing, Dave. Check out the photos. 04 Mar 2007 - Osceola Velo Club's Pat Schlager scores his first Florida Points Series (FPS) point of 2007! Pat posted a time good enough for 18th place in his category at the Wetlands Time Trial held near the small town of Christmas, FL on 03 Mar 2007. The 10 mile time trial was held in cloudy, windy, and chilly conditions and was part of Orlando's Festival of Speed weekend. [The FPS is a season-long competition in which racers score points for top-25 finishes in their categories at selected races throughout the state.] Pat was also able to improve on his average speed from the previous weekend's time trial in Archer, so well done, Pat! 26 Feb 2007 - Pat Schlager flew the flag for the Osceola Velo Club at the Team Florida Race Days Individual Time Trial held in Archer, FL on 24 Feb 2007. Pat bravely battled the strong, gusty winds to put in a respectable time for this early in the season. Unfortuately, he finished out of the top 25 in his category, so no Florida Points Series points for Pat. 11 Feb 2007 - Osceola Velo Club's Dave Zak improved in his racing performance at the Lake Mary Criterium during the opening weekend of the 2007 Florida Points Series. Dave rode strongly in the Men's Cat 5 race, but a couple of crashes in the middle of the pack split the field. Dave's small group was unable to regain contact with the leading bunch and was eventually lapped late in the race. Still, good race, Dave! Check out the photos. 01 Jan 2007 - Congratulations to Osceola Velo Club's Pat Schlager and Dave Zak for their performances at the 8th Annual New Year's Day Criterium held at the VA Health Center in Winter Park, FL. This was Dave's first race ever. (Yeah!) A record 34 racers lined up for the B-race (Cat 4/5, Women, and Masters) of 15 laps around the 0.9 mile course. The pace was high from the get go, with many racers (unfortunately, including Dave) being tailed off of the back by the midway point. Pat rode "comfortably" near the front of the peloton but was unable to go with any of the breaks. Pat finished strongly however, overtaking many in the main bunch sprint for a top-15 finish. Check out the photos. Dave Z., 2007 Pinellas Park Road Race. 16 Dec 2007 - The Osceola Velo Club is putting the finishing touches on its preparation for its first race of 2007, the New Year's Day Criterium at the VA Health Center in Winter Park, FL. This race is why the club began its off-season training period earlier than usual, a full month earlier in fact, since only one of the club's memebers has raced before. The training is going well, and the Osceola Velo Club should be a factor in the race come New Year's Day. Stay tuned for further updates and race results. Say "Welcome!" to the club's newest members Shannon Rivera and Michael Blackmore (see Club Roster page). 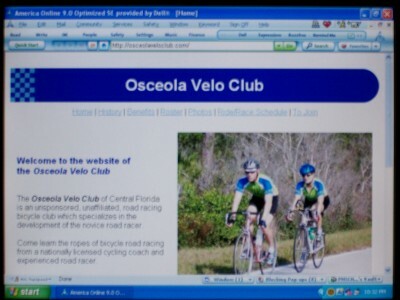 11 Nov 2006 - It only took 9 years but the Osceola Velo Club has finally entered the computer age with its very own website. This "Update" page is where we will keep you all informed of...well...updates to the club, the website, our members, training, racing, etc. Currently, we are in our off-season training period, making the segue from the aerobic endurance phase to the VO2max training phase. Yes, we started our preparation for the 2007 Florida road racing season a tad on the early side, but there is method to our madness (but its a secret, so there). Keep checking back to our website as it develops (obviously, we need more photos) and we will keep you updated on our progress training-wise and later, racing-wise. Ciao for now.